New Send & Sling Customize: Now you can personalize your Sling type with any fabric print you desire. As of March 23rd 2017, New Send & Sling™ Customize is released. Now you can personalize your V3 Sling type with any fabric print you desire. Sling your Sports teams (NFL, NBA etc), car/bike brands (Harley), TV show (TWD, GOT, etc), or a favorite pattern print (Stripes, polka-dots, etc…). Step 1: Go to any fabric store and select your favorite printed fabric. Copyright material such as Disney® are fine to use. Our legal team assures your purchased copyright fabric can be used legally for your OWN* Sling customization. The sturdier your fabric, the better. Tee shirts can be sent in, however, the material may not be long enough for a MODster for instance. Please keep this in mind when selecting your fabric for your Sling type. Please send at least 2 yards if possible, to avoid seams. 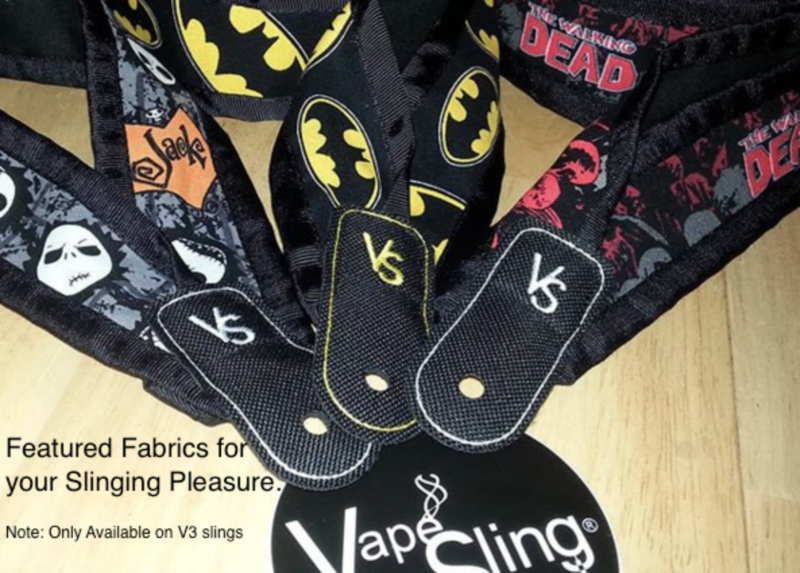 Step 2: Shop VapeSling.com and add your V3 Sling type to your cart. Immediately after, add the Send & Sling FREE option to the cart. Checkout and done on the site. We suggest using the most economical method: USPS “Thick/Padded envelope” rate. Using any clasp envelope of 9×12 or larger, your rate can be as low as $2.61 (1-4oz) and up to $4.30 (1 lbs). Step 4: 3-5 days after we receive your fabric, you will receive your new custom Sling. Reminder: Please add your Sling choice to the cart as well as the complimentary Send & Sling option. *NOTE: You are not re-distribute any of the S&S slings.